Rhys Vineyards, in a few short years, has established itself as one of the finest producers of pinot noir, chardonnay and syrah in all of California. Kevin Harvey is the man behind Rhys, and Kevin is about as passionate and knowledgeable a fan of Burgundy as one is likely to find in California wine country. In fact, I first met Kevin in Beaune at one of Maison Joseph Drouhin’s annual Paulées, and it was not until several years later that I even became aware that Kevin also owned a winery in California. In fact, I first learned of Kevin’s ownership of Rhys in a rather unpromising manner, as I included one of his second label bottlings of syrah sold under his Alesia label in the first installment of my Road Kill series. Oops! In any event, Kevin reached out to me when the Alesia syrah made my “worst dressed” list and informed me that I would probably be quite in accord with the overall philosophy of Rhys and Alesia and that I was likely to be quite happy with the stylistic direction of Rhys Vineyards in the years to come. He graciously sent me bottles of several of the Rhys and Alesia bottlings right on the heels of my inclusion of one of the Alesia bottlings in the Road Kill feature, and as he predicted, I was much more impressed with the quality and style of these other wines. I should note that this is not a typical behavioral pattern on the parts of winery principals who find one of their wines included in Road Kill- most get out the voodoo doll and start sticking pins in all the wrong places immediately! In any event, Kevin took the opportunity to enlighten me as to the other bottlings available at Rhys and under the Alesia label and I have been a fan since that day. I had not had an opportunity to schedule a visit to the winery during my September 2010 trip out to northern California, but managed to rectify this with a visit to Rhys, Ridge and Mount Eden all in one day during my swing through the region again in January of this year. The Santa Cruz Mountains are one of the most exciting regions in all of California wine country, and I have been a long-time fan of the other two stars in the appellation, Ridge Vineyards and Mount Eden Vineyards, and hope to one day soon have full length features on all three wineries in View From the Cellar. One of the region’s great attributes is its combination of stunning terroirs scattered amongst its spread out vineyards and the cooling effects of both the Pacific Ocean and San Francisco Bay. In this region Rhys Vineyards now has five distinct vineyards: Alpine Vineyard, Family Farm, Home Vineyard, Horseshoe Ranch and Skyline Vineyard. Each is quite unique in terms of both microclimate and underlying geology, resulting in very distinctive wines that truly exude their own terroirs. All of the vineyards are planted to young vines, but with their yields aggressively controlled and very dense plantings, these young vines are turning out some truly exceptional wines already- and just imagine what the future holds when these vineyards get to a riper old age! In a very short span of years Rhys Vineyards has clearly become one of the finest estates in all of California, and fans of old school, traditional styles of California wine need to remember that their quest for California’s greatest wines need not be limited solely to the founding wineries of yesteryear, as several newcomers such as Rhys Vineyards are very worthy of inclusion in the short list of traditionalists making great, cellar-worthy California wines. One of the things that I love most about the Rhys wines is that they are decidedly low alcohol wines by today’s California standards- without any manipulation in the cellars (no spinning cones or hoses thrust into the tanks prior to the start of fermentation here!) and these lower octane levels are certainly in part responsible for the stunning sense of terroir in each and every Rhys wine. But the remainder of the cellar protocol at Rhys is just what one would expect from a true Burgundy lover such as Kevin Harvey: all indigenous yeasts, whole cluster fermentations, gentle handling of the wines from beginning to end and bottling without filtration. The wood used here for the Rhys barrel program is meticulously controlled from start to finish, with oak staves purchased in France and dried for four years prior to being fashioned into barrels, to ensure both the origin of the wood and to make certain that the wood is properly aged before it is made into barrels. Across the board at Rhys, this attention to the detail to the provenance and maturing of the oak ensures that no Rhys wine is marred by raw, resiny wood characteristics from poorly-cured barrels. In fact, the wood treatment here is so subtle in the wines that I have never even bothered to ask Kevin Harvey what percentage of new oak he uses for his various bottlings, and believe me, that is not my customary modus operandi. While the primary focus at Rhys Vineyards is on pinot noir, it is important not to overlook the great chardonnays being produced here and the very, very good syrahs as well. The syrahs tend to be across the board a bit higher in alcohol than the pinots (typically around 13.5 percent, whereas the pinots can often range as low as 12.2 percent in some of the higher Santa Cruz vineyards), but still entirely restrained in terms of contemporary California standards for this lovely varietal. It is my impression from the few Rhys syrahs that I have tasted that the younger vine nature of the estate vineyards here shows up in the syrahs as a slight lack of focus and precision in comparison to the wines made from the equally young pinot vines. But the syrahs here share the same great base of minerality that is found in the Rhys pinots and I have complete faith that as good as the syrahs are here today at Rhys (and they are very good indeed), this is only the tip of the iceberg and the real syrah fireworks here are going to begin when the vineyards get just a little bit older. The chardonnays on the other hand, are not a work in progress, but art at its full-blown beauty already and are some of the loveliest chardonnays that I have tasted from the Santa Cruz region in years. While I have only tasted a couple of vintages of Rhys chardonnay from the Alpine Vineyard, there is also a bottling made from the Horseshoe Vineyard and also a blended bottling simply labeled as “Santa Cruz Mountains” chardonnay. But the focal point at Rhys Vineyards is clearly their pinot noirs, and these are clearly some of the greatest pinots being made today in all of California. There are five distinct vineyards, but even a few more bottlings of pinot, as for instance, a section of the Alpine Vineyard with easterly exposure is called Swan Terrace and is bottled on its own. Like most of the great wines that I know of the world over, the quality of the Rhys pinot noirs is found in the great viticultural work that the estate does in each vineyard. No doubt that the very meticulous approach taken by Kevin Harvey and his team in the vineyards is the key to the beautiful success of each and every bottle of Rhys pinot noir that I tasted from this report, and the fact that these wines are all hailing from young vines is absolutely extraordinary. The two vineyards on the northern side of the ridge and closer to the winery, Home Vineyard and Family Farm Vineyard, produce slightly less minerally expression of pinot noir- though with no shortage of their own unique expressions of terroir. The Home Vineyard has just recently been expanded (new plantations done in 2007), but until these vines come on line, there is only a single barrel of this lovely bottling. The Family Farm Vineyard is decidedly larger than the Home Vineyard, and has a lovely base of alluvial soil of loam and clay and sandstone, and an direct easterly exposure that recalls Burgundy. But the most minerally-defined wines clearly come from the three Rhys vineyards at higher elevations on the southern side of the ridge: Alpine Vineyard, Horseshoe Vineyard and Skyline Vineyard. Alpine Vineyard is a rocky, mountain vineyard located between 1200 and 1400 feet above sea level, with very thin topsoils and a variety of steep expositions. It tends to produce a very minerally-defined pinot, with a much more black fruity character than some of these other bottlings. The Swan Terrace section here is probably the finest parcel in the larger vineyard and a very compelling bottling of pinot noir. 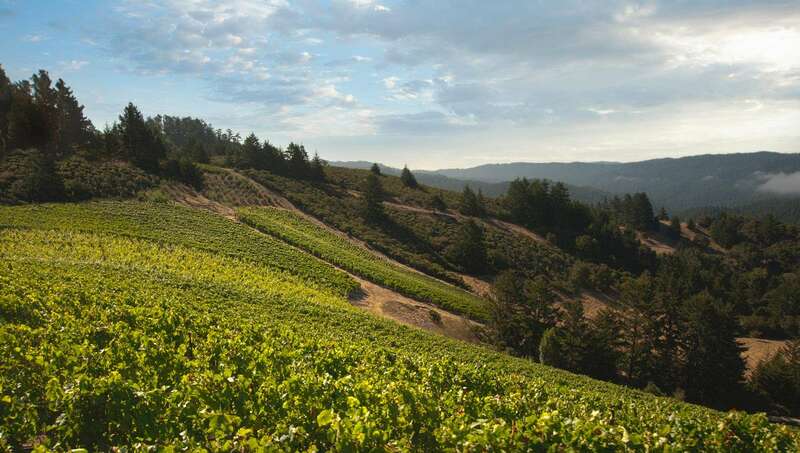 The Horseshoe Ranch Vineyard lies very close to Alpine, but is separated by a ridge that blocks some of the Pacific Ocean’s cooler air currents and is also on a more volcanic base of soil. While this is certainly not a warm vineyard by California standards, it seems a touch warmer than the nearby Alpine Vineyard and the 2008 Horseshoe Ranch pinot was a bit more than a half percent higher in alcohol as a result (though still happily under thirteen percent). The Skyline Vineyard is the highest in elevation of all the Rhys vineyards (much of it above 23000 feet), and consequently lies above the fog line and gets full sunshine all day long, with the elevation providing the mild temperatures that keep the ripening here on a relaxed pace throughout the summer. This is also the Rhys vineyard with the highest percentage of limestone in its rocky mix. All three of these vineyards have pinot and syrah planted, with only Skyline not also having a bit of chardonnay. Based on the wines that I have tasted from these three vineyards, they may well be the best terroirs for pinot noir in all of California. In addition to the wines that Rhys Vineyards puts out under their own label, they also have a second label that is used for wines that are made from purchased grapes. This is their Alesia label, and while there are no plans to discontinue the Alesia label, the number of wines put out under its auspices has fallen as the estate vineyards have begun to produce fruit suitable for the first label. The 2009s listed below were all tasted at the winery in January, and Kevin and his team graciously opened several older vintages of pinot noir bottlings as well from the Skyline Vineyard, Horseshoe Vineyard and Swan Terrace. This was my last stop of the day in the Santa Cruz Mountains, and having no idea how really isolated the wineries are up here, I had to soldier through the entire day without the benefit of adding to the stomach’s ballast at lunchtime, so I reached Rhys in a rather fatigues state. But the high quality of the wines here kept the focus up and my body reasonably sober until the end of the vineyard tour and tasting, and though we were late getting back up to San Francisco and missed a fine wine dinner planned for that evening, the superb quality of the Rhys wines more than made up for having to grab a late (and not particularly inspired) meal at the hotel and missing out on a few older Martin Ray bottlings. It is of course no longer a secret just how superb the wines being turned out at Rhys Vineyards are these days, as this has become one of the hottest wineries in California in the last six months or so, but at least here all the white-hot excitement is fully warranted and there is a lot more substance to the wines waiting in the cellars here than many of the equally hot wineries scattered around Napa Valley and the like. The current batch of wines at Rhys are the finest yet to be produced by the estate and will be well worth a special search to locate. The 2009 chardonnay from the Horseshoe Vineyard is the first vintage of this varietal to be produced from the vineyard, with the chardonnay all planted on the shallowest soils in the parcel. The wine tips the scales at a very judicious 13.2 percent alcohol and offers up a very beautiful and esthery bouquet of apple, pear, pineapple, lovely soil tones, a very gentle touch of leesiness, delicate floral tones and a judicious framing of vanillin oak. On the palate the wine is deep, fullish and very suave on the attack, with a fine core, bouncy acidity, great complexity and a very long, vibrant finish. A most impressive inaugural vintage of Horseshoe chardonnay! 2011-2020+. 92+. The 2009 Alpine chardonnay is a superb and quite youthful bottle of chardonnay that will certainly benefit from some time in the cellar. In true Rhys fashion, this is not a particularly ripe chardonnay (13.2 percent alcohol), but wonderfully complex and soil-driven, as it offers up a lovely mélange of pears, apples, a nice touch of iodine, ethereal leesy tones, tangerine, a bit of buttery oak, hints of honeycomb and a great base of soil. On the palate the wine is deep, full-bodied and beautifully focused, with crisp acids, beautiful structure and a superb grip on the very long, reserved and intensely flavored finish. Very high class juice. 2013-2030+. 93+. 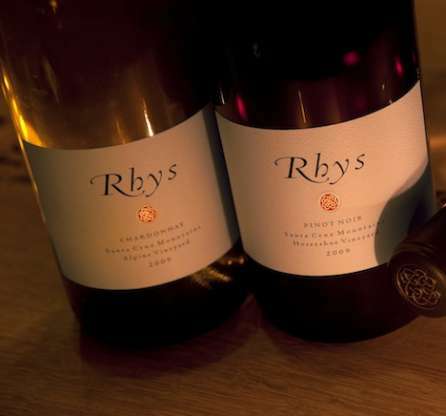 The 2009 pinot noirs at Rhys Vineyards are surprisingly similar in style to the 2009 reds from Burgundy, with a sumptuous, silky early palate impression and a degree of opulence that is not particularly classic in Burgundy nor the paradigm of what Kevin Harvey and his team are aiming for at Rhys. But that said, they are incredibly delicious wines that will make a lot of friends early and may well serve an important function of allowing Rhys Vineyards’ clients to keep their hands off of the more reticent 2008s and 2007s for a bit, allowing the earlier vintages to blossom fully with bottle age. The 2009s are an extremely strong set of wines across the board and amongst the most sophisticated and classy pinot noirs made today in California. Just another two hundred and fifty new subscribers and I am going to get myself organized and get on the Rhys mailing list- before it is too late! The 2009 Family Farm pinot noir is a really beautiful bottle in the making, as it offers up a complex and very refined nose of plums, black cherries, cocoa powder, a touch of caramel, very lovely soil tones, woodsmoke and a touch of new wood. On the palate the wine is deep, fullish, pure and silky on the attack, with fine mid-palate depth, soft tannins, lovely acids and fine length and grip on the forward and classy finish. 2013-2030+. 92+. The Bearwallow bottling is made from purchased grapes and typically shows the slightly warmer aspect of Anderson Valley in comparison to the estate’s own Santa Cruz Mountain vineyard bottlings. The 2009 is more black fruity than the Family Farm, as it offers up a complex and classy nose of black cherries, dark berries, a touch of fresh rosemary, dark chocolate, incipient notes of bonfire, soil and a touch of new oak. On the palate the wine is deep, full-bodied, tangy and really beautifully structured this year, with a sappy core of fruit, ripe tannins and a very, very long, zesty finish. It seems like the style of the 2009 vintage dovetails perfectly with the terroir of Bearwallow, as this is a raging success. I would try to tuck it away for a few years in the cellar to allow its secondary layers to blossom, but it is already really a delicious glass of pinot! 2015-2030+. 93+. The 2009 Alpine pinot is superb and perhaps a small step up in quality from the dancing Bearwallow this year. The deep and impressively complex nose jumps from the glass in a blaze of dark berries, cola, vinesmoke, superbly complex soil nuances, fresh herbs, a touch of gamebird and a stylish base of new wood. On the palate the wine is deep, full-bodied and quite black fruity as well, with a rock solid core of fruit, ripe, well-integrated tannins, tangy acids and great backend soil drive on the very long and classy finish. This is more overtly “Burgundian” in its stylistic sensibilities than the Bearwallow, but will need even a few more years than that wine to fully unfold and start to realize all of its potential. Superb juice. 2017-2040. 94. The 2009 Skyline pinot is another absolutely stellar bottle in the making from Rhys. The deep and complex nose offers up a black fruity mélange of dark berries, cassis, intense notes of cola, a touch of tariness, a great base of soil, woodsmoke and cedar. On the palate the wine is deep, full-bodied and very pure and structured, with a fine core of sappy black fruit, ripe tannins and a very long, focused and tangy finish. Lovely juice and another absolutely stellar example of the vintage. 2016-2040. 94. As readers might recall from last October’s article, the Swan Terrace is the finest section of the Alpine Vineyard and it is bottled on its own in top vintages. The 2009 is very emblematic of its vintage, offering up a seductive nose of black cherries, vinesmoke, coffee bean, a very stylish base of soil, a touch of mustard seed and a bit of lead pencil in the upper register. On the palate the wine is full-bodied and very suave on the attack, with excellent mid-palate depth, superb focus and balance, quite gentle tannins, and excellent length and grip on the already quite silky finish. Just a lovely wine that will be hard to resist right out of the blocks, but which really deserves a few years in the cellar to allow more of its inherent complexity to emerge. 2014-2040. 93+. The 2009 Horseshoe Ranch pinot noire from Rhys Vineyards is a lovely wine in the making, as it offers up a deep and classy nose of black cherries, dark berries, vinesmoke, coffee bean, a nice touch of fresh herbs, lovely minerality and a touch of new wood. On the palate the wine is full-bodied, complex and really sappy at the core, with superb focus and grip, ripe tannins, very good acidity and excellent length and grip on the perfectly poised and elegant finish. This is the most reserved of the 2009 Rhys pinots and I would opt to tuck it away in a cool corner of the cellar for at least the next five years before even considering pulling a cork. 2016-2040. 93. As I reported in October, the 2008 Skyline Vineyard pinot noir from Rhys is stunning, and one of the most beautiful, dancing bottles of young pinot that I have ever had the pleasure to taste from California. This is decidedly low octane juice, coming in at only 12.2 percent alcohol, and consequently, it will need a few years in the cellar to soften, as there is not a lot of puppy fat fruit here at this level of ripeness. Six months on from the last time I tasted this superb wine, it is blossoming beautifully, offering up a fine nose of black cherries, dark berries, cola, espresso, a gentle note of vinesmoke and a complex base of soil. On the palate the wine is deep, full-bodied, nascently complex and nicely reserved, with fine mid-palate depth, ripe, firm tannins and excellent length and grip on the very classy and cool finish. Great juice in the making- all this needs is a bit of time alone in the cellar! 2018-2040+. 94. And the pinot from the “filet section” of Alpine Vineyard in 2008- just superb as well, but this wine has closed down a bit since I last had it in September of 2010 and really could use some time in the cellar. The nose is deep, complex and now showing a bit more structure than was the case several months ago, as it offers up scents of black cherries, dark berries, woodsmoke, fresh thyme, complex soil nuances and cedar. On the palate the wine is deep, full-bodied, complex and classy, with a fine core, nascent complexity, moderate tannins and a very long, reserved and soil-driven finish that closes with lovely grip and focus. I thought this would be drinking really well by 2013 the last time I tasted it, but that now seems a bit premature for primetime drinking. 2017-2040+. 94+. The 2008 Horseshoe Ranch pinot noir from Rhys Vineyards is a great bottle of pinot in the making, with its 12.8 percent alcohol level providing perfectly ripe and vibrant fruit that is just a perfect foil to the purity of the soil expression here. I was very happy to revisit this beautiful bottle in the making during my January visit and found the wine cruising along just beautifully. The nose is a deep and complex blend of dark berries, dark chocolate, gentle notes of game, coffee bean, superb soil tones and a deft framing of cedary wood. On the palate the wine is full-bodied, complex and beautifully structured, with a great core of fruit, laser-like focus, ripe tannins and a very, very long, tangy and nascently complex finish. Simply superb juice. 2016-2040. 95. This was the first opportunity I had found to taste the 2007 Skyline pinot and it is a lovely bottle in the making. The first class nose offers up a complex mélange of cassis, cola, woodsmoke, a great base of stony soil tones and a nice touch of spicy oak. On the palate the wine is deep, full and just starting to blossom, with excellent mid-palate depth, lovely focus and balance, moderate tannins and excellent length and grip on the bouncy and beautifully poised finish. I would still try to exercise a bit of restraint and let this wine fully start showing off its secondary and tertiary layers of complexity, but would also understand those who cannot defer gratification any longer and would like to drink this lovely bottle today! But, this wine is emphatically still climbing, and as good as it is to drink right now, it will still improve if left alone in the cellar just a bit longer. 2015-2035. 93+. The 2007 Swan Terrace pinot saw a bit more new oak in this vintage than was the case in 2009 for instance, as it was raised in two-thirds new barrels in comparison to one-third for the latter vintage. Consequently, the wine is just a touch more marked by its wood component on both the nose and palate at this point, as it offers up a youthful mélange of black cherries, dark berries, espresso, nice herbal complexities, smoke, a fine base of soil and a fair bit of spicy new oak. On the palate the wine is deep, full-bodied, closed and beautifully balanced, with fine mid-palate depth, tangy acids and superb length and grip on the still fairly chewy and primary finish. This will be lovely, but it seems pretty clear that the 2009, with half the new wood, shows even more terroir than the 2007- despite the ’07 hailing from a vintage that should be even more adroit that showing off its soil tones. 2017-2035+. 92+. I had never tasted the 2007 Horseshoe pinot from Rhys and it is another outstanding bottle in the making. In fact, it is going to be very difficult for a very long time choosing a favorite between the 2007 and the 2008 Horseshoe, as they are both stellar pinots. The nose on the ’07 is a superb and very black fruity mélange of cassis, dark berries, a touch of tariness, bitter chocolate, vinesmoke, very complex soil tones, and a nice touch of cedary wood. On the palate the wine is deep, full and very, very pure, with lovely, nascent complexity, a fine core, ripe, well-integrated tannins and outstanding length and grip on the focused and tangy finish. A very young and very, very classy bottle of pinot. 2017-2040. 94+. Horseshoe Ranch Vineyard has great terroir, which is easily ascertained by the beautiful pinot noirs that hail from this site, but this is still a young vineyard that was only planted in 2004 and the syrahs may need a bit more time to show off all the class of this locale that is already so evident in the pinots from Horseshoe. That said, the 2009 Horseshoe syrah is excellent, as it offers up a very classy nose of cassis, pepper, bitter chocolate, incipient notes of venison, stony minerality and a touch of cedar. On the palate the wine is deep, fullish and intensely flavored, with tangy acids, ripe tannins and very fine length and grip on the focused and fairly structured finish. This is decidedly less ripe than the 13.9 percent of the 2008 Horseshoe syrah, weighing in at 12.8 percent in 2009, and it delivers decidedly more precision and nascent complexity as a result. Fine juice. 2017-2035+. 92. The 2009 Skyline Vineyard syrah is another outstanding example of the vintage, offering up a complex and classy nose of black raspberries, dark chocolate, superb minerality, a touch of new leather, pepper and a touch of violets in the upper register. On the palate the wine is deep, full-bodied and beautifully balanced, with blossoming complexity, excellent mid-palate depth and fine length and grip on the ripely tannic finish. Like the 2009 Horseshoe syrah, the Skyline syrah tips the scales at a very cool 12.8 percent alcohol, but shows just a touch more of the vintage’s flamboyant nature on both the nose and palate. A lovely bottle in the making, which I may be underestimating just a touch in terms of its potential for development down the road. But a wine I would love to have in the cellar to watch it unfold over the coming decades. 2016-2035+. 92+.